Science, democracy, and capitalism, some treasured institutions of the world's most advanced societies, in terms of health, wealth, freedom, and equality, are being criticized more and more. I acknowledge that there are some severe problems surrounding these institutions but I think we should not see these institutions as the problem. All three of these institutions have been criticized fiercely in recent years. Science has come under attack in response to cases of scientific fraud, systematic corruption of the scientific process, and the discovery that many scientific findings could not be replicated. Democracy has been criticized in response to Brexit and the rise of authoritarian populists. Critics argue that democracy is not stable and that it is unwise to let all citizens have a say in complex issues. Capitalism is criticized for undermining equality, freedom, science, and democracy. The institutions of science, democracy, and capitalism have brought great progress. Science at its best has helped us create more insight into reality and has helped make possible many innovations which make our lives better. Democracy at its best has helped societies become more stable and peaceful by giving populations power instead of rulers alone. Capitalism at its best is a system to allow for exchange and specialization leading to prosperity, interdependence and stability within and between countries. I think we should not view these institutions as the core problem but the forces undermining these institutions. There is no more reliable way to find out truth than science. When factors like money and power undermine the scientific process we should not abandon our confidence in science but protect it from these undermining factors. In countries like the USA, democracy is now being undermined by big money, which has a large grip on politicians. We should not let go of our confidence in democracy but protect it from these corrupting factors. Capitalism has partly evolved into a system which seems to be more undermining social and environmental progress than to support it. For lack of a better system, we should not fight capitalism as an idea but protect it from forces leading to the excesses we have recently seen which, among other things, requires much more regulation (see here). 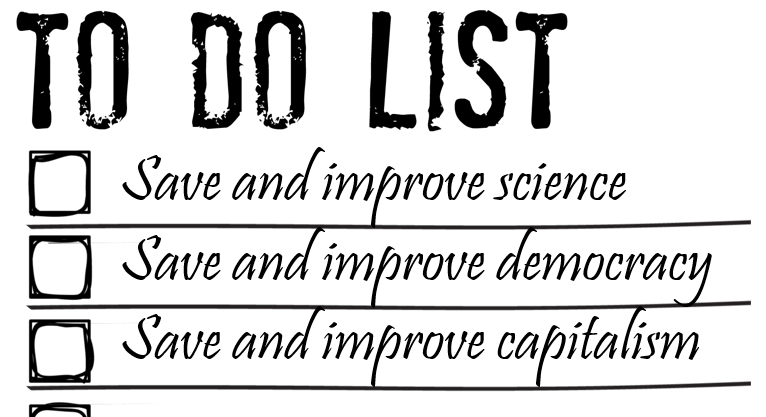 Rather than viewing science, democracy, and capitalism as clearly defined systems which either work or don't, we should view them as works in progress. As time goes by, we should develop these systems and find out more about what it takes to make them work better and what it takes to protect them from undermining forces. The Canadian government is surprisingly wishy-washy about freedom of expression and science. The recently passed Bill C-16 seems to make talking about some findings in psychology illegal because they might offend people. The Guardian newspaper has pointed out that in the US the Left has come out against free speech but might want to support it "as a tactic" now that Trump is in power. So democracy, free speech and science are not accepted as core values by cultural marxists and this group has a good deal of power, enough power to shape legislation in Canada.